The union wants to see an improvement in the province’s health department and premier Supra Mahumapelo fired within two weeks. The National Health, Education & Allied Workers Union (Nehawu) will go ahead with a planned two-day stayaway of all public servants in the North West if its demands regarding the improvement of the province’s health department and the dismissal of the premier are not met within 14 days. This comes after the union yesterday gave the inter-ministerial task team, headed by Nkosazana Dlamini-Zuma, 24 hours to respond to their memorandum. The memorandum included a list of 24 grievances. The union threatened that all public servants affiliated to their union would embark on a stayaway in the entire province if the task team did not respond positively. The task team said they were paying attention to the union’s grievances, which led to the union postponing the scheduled strike for two weeks. This will, hopefully, allow the task team to deal with the issues in North West. Nehawu spokesperson Khaya Xaba said: “The inter-ministerial team is busy responding to our demands. Some can be attended to immediately, while others are long-term. 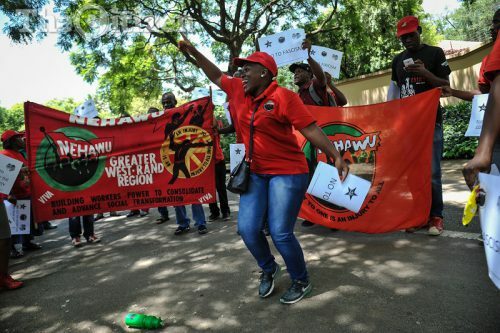 Some of the union’s grievances include issues of outsourcing, corruption, unpaid bonuses and a demand for a forensic investigation into various departments within the province. The union has also been actively campaigning for the removal of Supra Mahumapelo as premier. According to Nehawu, “he has demonstrated that he is incapable of leading a clean state but rather a government that is characterised by corruption”.